Parents of IDF soldier whose body is being held by Hamas visit 9/11 memorial with relatives of September 11 victim. 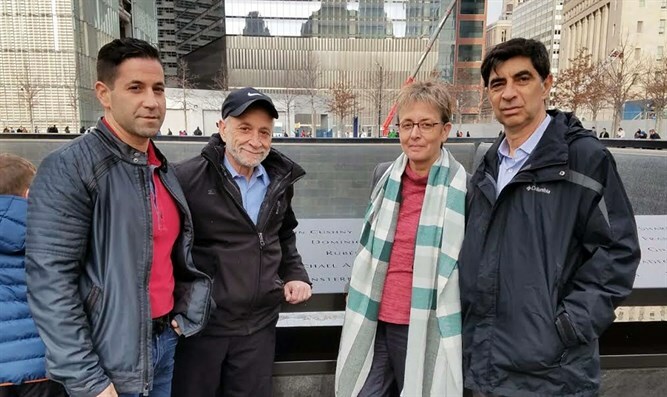 The parents of IDF Second Lieutenant Hadar Goldin, who was killed in Gaza in 2014 during Operation Protective Edge and whose body is still being held by the Hamas terror group, visited the 9/11 Memorial in Manhattan on Tuesday with the father and brother of Nancy Morgenstern, who was killed in the September 11 attack on the World Trade Center. Harvey and Jeffrey Morgenstern met Simcha and Leah Goldin at an event on Sunday hosted by the Belev Echad organization. Mr. and Mrs. Goldin are currently in New York to rally support for their campaign calling for the return of their son's remains. Founded in New York City in 2009, Belev Echad established a global initiative to honor these brave warriors of the IDF and their families, residing both in Israel and the United States, through a system of love, support and education. Through programs for wounded warriors, career counseling, scholarship funds and social and educational events, Belev Echad makes a small, but meaningful, contribution towards repaying them for their service. Last week, the Goldins met with Rep. Brian Mast (R-FL), who served in in Afghanistan, stepped on an improvised explosive device and had both his legs and one of his fingers amputated. A staunch supporter of Israel, Mast volunteered with the IDF in 2015, packing medical kits and moving supplies at a base outside Tel Aviv. Mast called for efforts to be made to bring Goldin’s body home. “I did not know Hadar personally, but during my time serving alongside the IDF I knew so many who were just like him. I met some of the most humble and compassionate people that I’ve ever known.